Want to know when the next full moon will be? Whether there was a full moon the day you were born? How far away the moon is from the earth at this very moment? 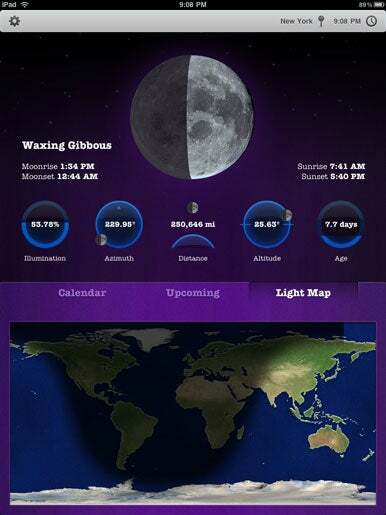 Phases HD from Bjango provides that information as well as the moon’s position in the sky, the percentage of the moon that’s illuminated, and the times of moonrise and moonset and sunrise and sunset. It does so, Bjango says, for more than 20,000 locations. Moon In My Window: Phases HD displays real-time data about the moon—in this case, the moon over New York City. The bottom of the screen shows portions of the earth that are currently dark and light. The app is nicely designed and takes advantage of the iPad’s display capabilities. But what you see is all you get: Phases HD is easy on the eyes, but lacks any real depth of information about the moon itself—a few obvious deficiencies are the lack of a moon map and the absence of contextual background information. In other words, Phases HD does what it does well. But you might want to look into some of the many other free or low-cost iPad apps if you want more detailed information about the moon.